Probing nanometer-sized structures to evaluate the performance of integrated circuits (IC) for design verification and manufacturing quality monitoring demands precision nanomanipulation technologies. To minimize electron induced damage and improve measurement accuracy, scanning electron microscopy (SEM) imaging parameters must be cautiously chosen to ensure low electron energy and dosage. This results in significant image noise and drift. 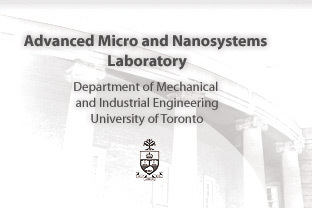 This work presents automated nanoprobing with a nanomanipulation system inside a standard SEM. For details, refer to [J102] on the Publications page. Gap junctional intercellular communication (GJIC) is a critical part of cellular activities and is necessary for electrical propagation among contacting cells. Disorders of gap junctions are a major cause for cardiac arrhythmias. Dye transfer through microinjection is a conventional technique for measuring GJIC. To overcome the limitations of manual microinjection and perform high-throughput GJIC measurement, here we present a new robotic microinjection system that is capable of injecting a large number of cells at a high speed. The highly automated system enables large-scale cell injection (thousands of cells vs. a few cells) without major operator training. For details, refer to [J107] on the Publications page.